IN WINTER MONTHS, many anglers like to head to the Bahamas for a break from the cold weather and a little bit of fun on the flats. 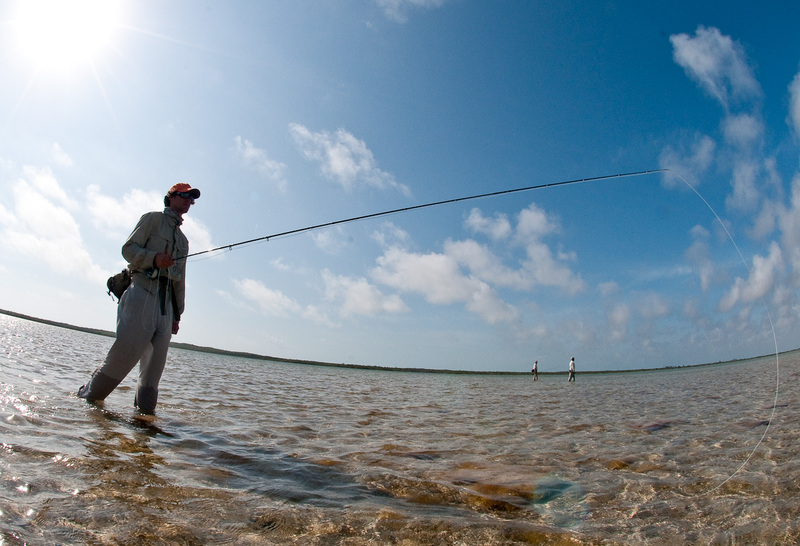 In the Bahamas and many other parts of the world, anglers can chase bonefish on foot in very shallow water. Here’s the problem — bonefish swimming in very shallow water are often at their spookiest, especially when the water’s calm as well. If you’re chasing shallow water bonefish on foot, these handy tips will help you get your fly into that fish’s mouth — which isn’t going to happen if you spook him first. Walk slowly. The noise created by your feet sloshing through the water and your soles hitting the flat is going to be much less of an issue if you walk slowly. Approaching a bonefish on the far side of a shallow, calm flat might take 15 minutes or more. That’s OK — these are some of the coolest shots in bonefishing, so take your time. Step onto the balls of your feet. Landing hard on your heels can make a lot of noise, especially if you’re walking on a “crunchy” bottom. Your steps will be much quieter if you land on the balls of your feet. And speaking of crunchy bottoms…. Be aware of the bottom in front of you. As you spend more time on the flats, you’ll realize that certain types of bottoms are covered with small shells and limestone and others are covered with sand or soft grass. Look at the flat and know what’s in front of you — if you’re nearing a shot at a fish swimming at you and you see crunchy bottom ahead, it’s probably best to wait for the fish to come to you, rather than risk spooking him with a crunchy step. Gather your line slowly. When you’re in position to make a shot, it’s helpful to pull the looped line behind you into coils at your feet. This creates less drag when you shoot line and your running line is pulled up out of the water. Don’t yank when you pull that line in — the tearing sound can send your bonefish running. Go slow. Recast slowly if he doesn’t eat. Bonefish feeding in shallow water are often moving really slowly, so you may get a chance to make additional shots if the first one doesn’t connect. After your first shot, strip your line in slowly, and pull the line out of the water slowly before your next cast. Go slow!